Seen in Thunderbird 2.0.0.9 with Lightning 0.8pre Build 2007-12-27-04-mozilla1.8 on Win XP. When creating a new task or event by dropping an E-Mail on the Mode Toolbar, taking the text as a description only works if you use the Message Pane in Thunderbird. I don't use it, so the proposed description always is Thunderbird's start page; in general it is the last site/message that was loaded in the Message Pane during a session. Open the message in its own window is not sufficant. I saw this with different IMAP-accounts. The offline-settings don't make a difference. 1. Create a fresh profile with IMAP-account, install Lightning. 2. Disable Message Pane by pressing F8, restart Thunderbird. 3. Create new task/event by dropping an E-Mail on the Mode Toolbar. Proposed description is Thunderbird's start page. Proposed description should be the Mail Body. I still see the issue using Lightning 0.8pre 2008012618. I tested again in a fresh profile, with two different IMAP-Accounts (arcor.de, web.de). I didn't change Thunderbird's default settings, so it just pulls the headers of the E-Mails. See  for a screenshot (text of Thunderbird's start page as the proposed description). Thunderbird starts in Mail Mode. If I switch to Calendar or Task Mode, switch back to Mail Mode and then try to reproduce the described behaviour, the description field of the new task/event is blank. Lightning 2008012320: confirmed the described behaviour in comment 0. I don't think this is related to IMAP because I can reproduce it and I only use POP3. I also didn't need to create a new profile or restart Thunderbird. 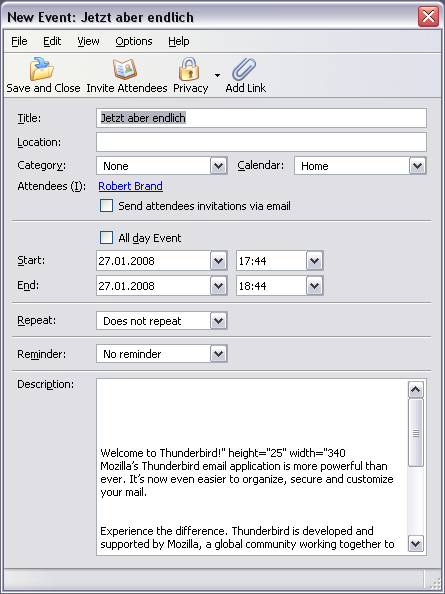 Dropping Mails vom POP3 or IMAP-Accounts will take the description from Thunderbird's start page. I try to repeat this a few times, but I could not always reproduce the exactly behavior. After some tries the description field becomes blank. 1. Highlight message 1 so that message 1 body appears in the message pane. 2. Turn the message pane off. 3. Drag message 1 to task area and drop - new task appears with message 1 body as description. 5. Drag message 2 to task area and drop - new task appears with message 2 subject as title but with message 1 body as description. Thunderbird Version 2.0.0.12 (20080213) and lightning 0.8 (Build 2008033120) on Windows XP SP2. It is reproduceable every time. I would like to confirm this is still an issue with Thunderbird 2.0.0.18 and Lightning 0.9rc2 (Build 2008091718). on Ubuntu 8.04. you cannot drop a message at all. Very disappointing. Is there an easy way to reuse that function from gloda? First try using a synchronous stream listener because we need the information for opening the new event/task dialog. I do not know if I really need a new instance of nsIMessenger or if I can reuse Thunderbird's global one. It is also unclear what are proper values for aBytesToRead (for whole message) and aMaxOutputLen (for truncation of the plain text) in our use case. The second parameter should be aMsgHdr.Charset. Looking at the other calls to getMsgTextFromStream and also the source, it seems there is no other possibility than to pass arbitrary numbers. Maybe using hex numbers looks a bit nicer here though. > The second parameter should be aMsgHdr.Charset.